Moving is hard for anyone. It’s widely known to be one of the most stressful life experiences. From bank accounts to mental energy, moving can put a strain on every resource we have. But as taxing as it is on an adult’s schedule and emotions, it can be even harder on those of a child. Often, children don’t fully understand what is happening or why it has to go on for many, many days. Also, concerns of keeping young ones safe through the process can add anxiety to the mix. For these reasons and others, moving with kids can be challenging for even the best parents and caregivers. This is where affordable storage can be a lifesaver. Many have discovered the value of getting boxes out of sight and mind as soon as they are packed. Most importantly, this keeps the spaces in the homes on either end of the move clear of stacked boxes and teetering piles of furniture. 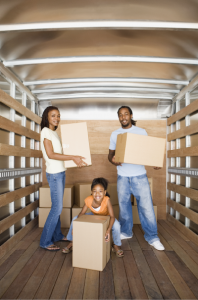 A self-storage space can significantly ease the stress of a move with children. How the adults in their life present an upcoming move can make all the difference in how children respond to it. If adults are openly negative, the experience is likely to be negative for children as well. Parents who make it seem like it will be exciting and fun are more likely to get cooperation and positive energy going with their children. We recommend announcing the move after a special meal or at an important family meeting. Naturally, it is best to listen attentively and address any concerns or worries, but always with the goal of helping them see the potential good in the upcoming changes. Children who are allowed to have a say in the moving process are far more likely to be on board with attitude and behavior. We recommend involving them in the decision-making and the packing whenever possible. Allow little ones to help with decluttering as long as it does not add to anyone’s stress. Involve older children in the research of the new place. Ask for their opinions with decor or room colors. Let them help make plans. School age children can map the move together with adults. They can even plot out routes for getting to school, work, the park, the mall, or the movie theater near the new place. And, children of any age can be a part of a “We did it!” celebration on the other end. 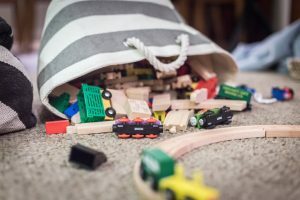 We all know it would be crazy to pack the TV, tablets or favorite toys first when moving with children who are really too young to be involved in much of the process. There are going to be moments when sitting a child in front of a cartoon or letting them play their favorite Disney app is really the safest, most sane thing to do at that moment in the moving process. There should be no shame in that. But most of us would like to think we can do better—at least some of the time—and would prefer to use more varied distraction when we can. When possible, consider encouraging young ones to create masterpieces with edible finger paint on their high chair tray or try filling up large plastic storage bins with sand/rocks or uncooked rice/beans for sensory playtime in a designated space. These activities give little ones something their hands and minds can explore, and give parents the opportunity to sneakily pack up the box of binkies. Other popular distraction activities are threading pipe cleaners through the holes of a colander and letting a child get into one of the many empty boxes lying around to color their surroundings while other boxes are being packed. Sorting is a skill children of all ages can practice. It can be used as an educational distraction or as a practical contribution to the move. Small children in a high chair can sort their snack bites by size on their plate or their crayons by color into muffin tins. Children who are old enough to safely sort buttons, coins, or cards can be entertained by the goal of getting them into similar piles. Older children can be put to work sorting socks, mittens, shoes, or pantry items prior to packing. Even teenagers can sort and file paperwork and bills prior to taking files to the self-storage space. Because moving is such a significant life event, journaling through the process can be very helpful to children. Children old enough to write (or even just draw) can spend time illustrating or describing memories in the old place and exciting adventures ahead in the new. In fact, any writing practice can be valuable at this time. Very young children can work on coloring or letter formation. Older children can do more, such as help address “We’re moving” cards, make lists of supplies, or plan menus and grocery lists. Many of our customers underestimate the sheer intensity of a move with children, so when others offer to take the kids, they fall back on the desire not to impose and graciously decline. We highly recommend accepting any and all offers from trusted friends and family to watch the kids or take them fun places while parents pack. Parents should also feel no shame in asking for help in this department. Oddly enough, you are probably more likely to get help with the kids than with the actual moving, but some people are lucky enough to get help with both. We hope you will choose one our affordable storage options to ease stress with your next move, especially if you have children. Storing things during and after a move allows for a gradual packing and unpacking process instead of a massive upheaval in everyone’s schedule. Boxes of things not needed for the transition can be out of the way until after the daily items are unpacked and given homes in the new place. 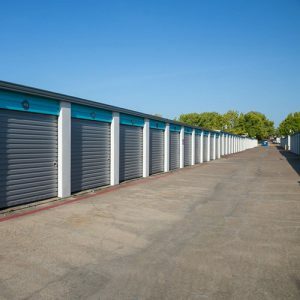 And keeping already-packed boxes, large pieces, and valuables in a self-storage space will do much to keep little ones safe in the comings and goings of a move.